It took me 4 or 5 years to persuade Louise to let us get a dog; it was then a case of waiting for a Lapphund to become available. As is the case with Lappies demand always seems to exceed supply - we went on a number of puppy lists with various breeders hoping to be the fortunate owners of one of their puppies. In the end our wait for a Lapphund was almost 18 months by which time I would have had a 3 legged green one if that was all that was available. As things transpired we were fortunate to be offered a choice of 2 puppies from Carol Stuckey (Honeybears) - a rather cute almost white dog or a wolf sable dog. It was Lou's decision to go for the wolf sable and as a result Mylo came into our lives. I was so pleased that we had eventually been lucky enough to be given the opportunity to share our lives with a Lapphund that I wrote a daily diary covering our initial experiences with Mylo, if you would like to read it please click here. 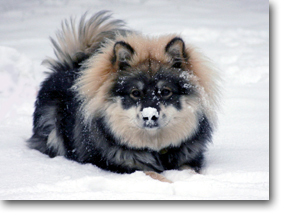 I'm not going to claim that it was the original Lapphund dog blog but I have yet to read one that predates it. Over the past 10 years Mylo has continued to fill our lives - yes he can be a little noisy, yes he can sometimes be a bugger off-lead but, other than him being quieter and to have better recall, there is nothing I would change about him; actually I would change one thing and that would have been for him to have not had to be neutered, as I am sure he would have sired some wonderful pups.